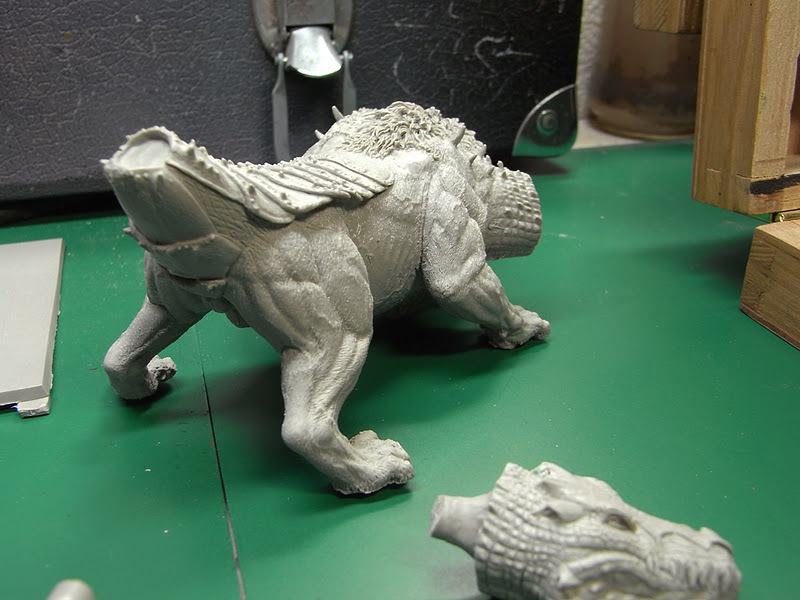 The model in this review will be used for a bigger project of mine that contents a greek mythologic theme. Bellerophon on Pegasus fighting the Chimera. A comission piece that is planned to be finished in the first months of 2012. The model itself comes in a massive box that makes you a little bit stunned in respect of its seize, the great sculpting work of Daniel Cockersell and the great master paintwork by Ben Komets. 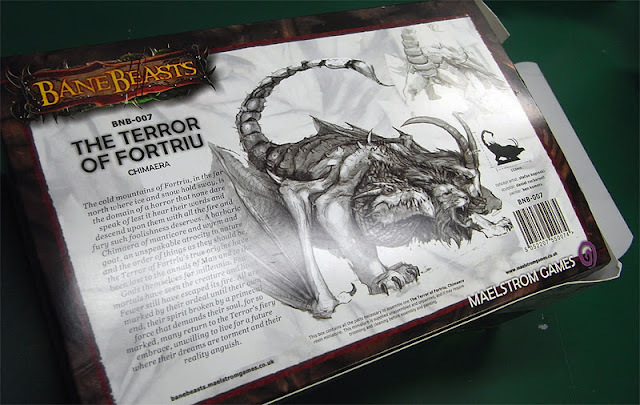 On the back of the box you find the official artwork and a little text to the background of the Chimera. There is also a little information about seize comparision to casual 28 mm Infantery gaming models. That did not prepare me for the monster I was about to unpack. 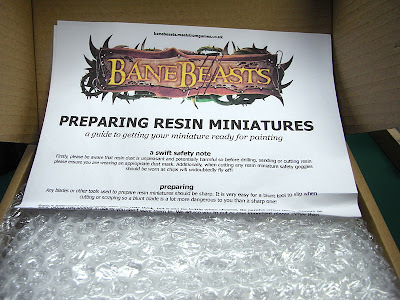 When you open the box you first find a paper wih instructions and hints on how to handle resin models. That is worth a big thumb up from my side. 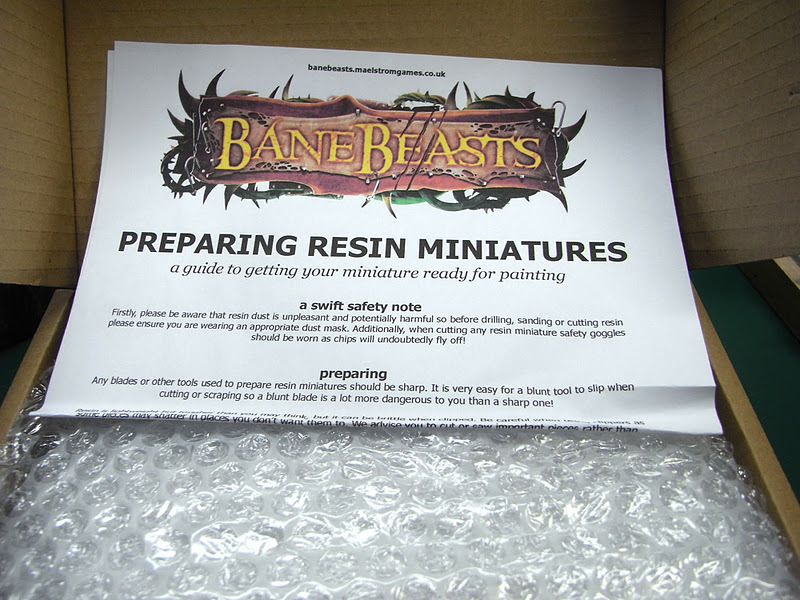 If you are interested on how the jungle handles Resin, check this article in german or english language. 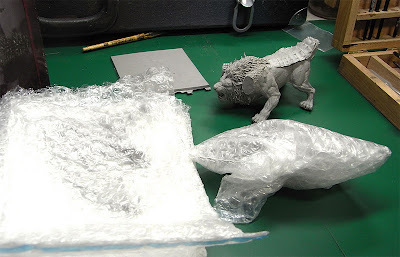 The different parts of the model are deliverd in bubble wrap and everything is packed extraordinary safe. There is no space in the parcel and the pieces don't bounce around. 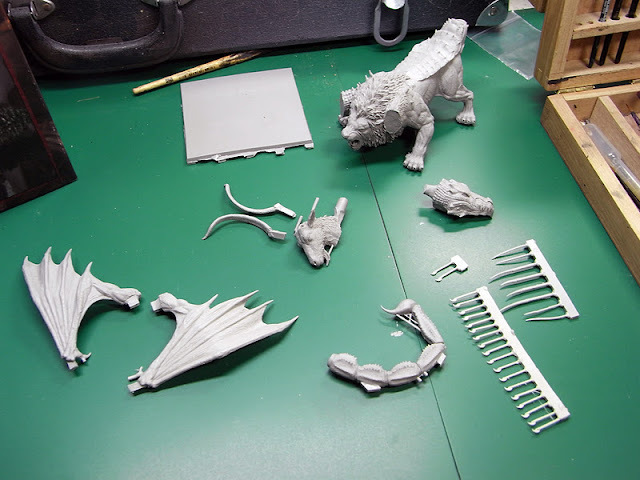 In the next photo I have already unpacked the main body and the base. The details in the fur of the main body are just amazing. The overall appearence really makes you stunned due it great details. The fitting of the parts looks pretty easy too after some cleaning on the important parts. Personally I am not sure about the base. 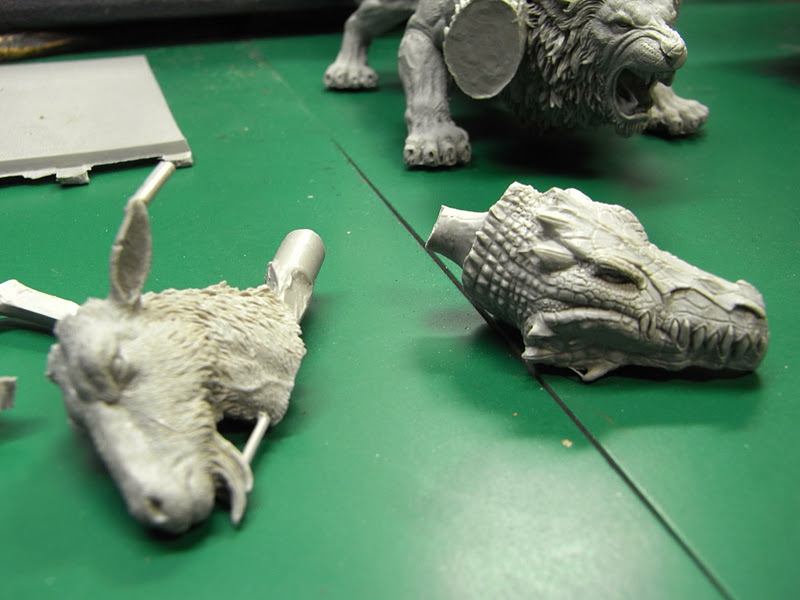 For Gamers I would think it is a fine addtion to put your model fast up for the gaming table. For me, as mostly painter this is resin junk. No offence at all. 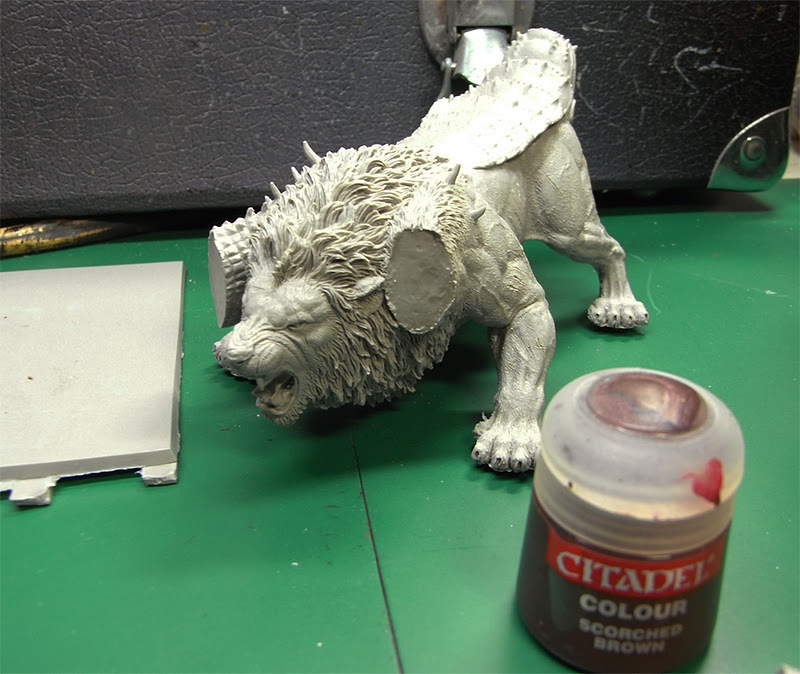 I could imagine some sculpted terrain on it, better - I wished for it if I would bring that beast on top of it. 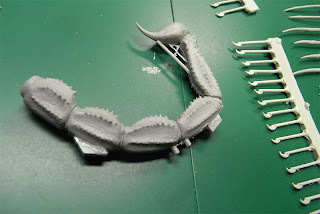 Not the cheapest model, BUT you get a really good quality in the Resin cast and a model that has power like a Wild West train rolling onto you while you are chained to rails. For my project the model is just perfect and I guess a mass of gamers could have their fun with shocking their battle friends with such a beast. The model fits perfectly as a Monster to other board games. I hope you enjoyed this little Mu #21 - as told let me know if you are interested in more and there will be some more. 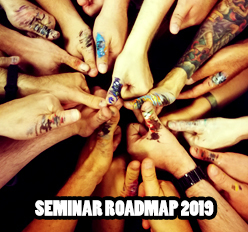 Please remember that this always takes time for preparation, thinking and writing and if you want to say thanks you can do it in the comments or donate a little coffee to the jungle. Best Wishes and keep on happy painting! Nice model. 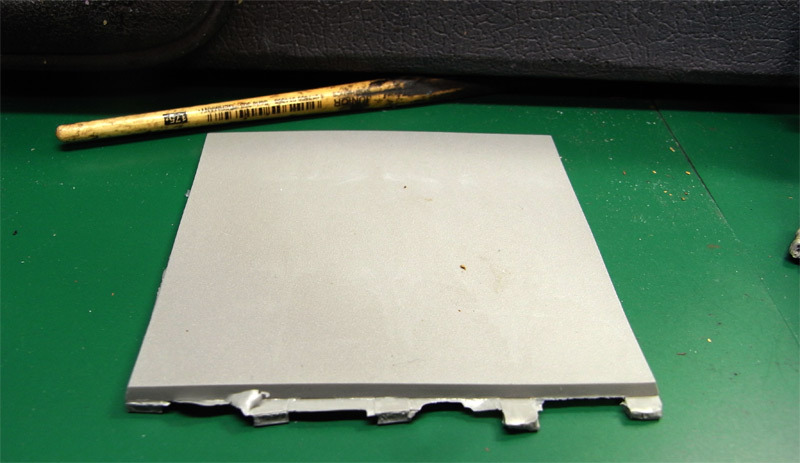 Too bad about the base, I'm sure make something amazing out of it. i recently saw the actual model on the cover at Maelstrom and i can safely say that it is far and away the finest painting i have ever seen. this is a spectacular model and i cant wait to see your take on it. Thankyou for showing this model off for us! Mein English ist echt schlecht, also schreib ich mal auf Deutsch. Ich hoffe das ist nicht so schlimm. Ich bin wirklich sehr gespannt was du aus dem tollen Modell rausholst. Die Pose und die Details sind schon mal umwerfend. Weil ich einmal schreibe musss ich dir/euch einfach mal ein riesengroßes Lob für eure Arbeit hier aussprechen. Es ist so inspirierend und toll euch bei der Arbeit über die Schultern schauen zu dürfen. Und die Tutorials die ihr schreibt, sind der Hammer! Ich habe mal noch ne kleine Frage bzw. Bitte. Könntest du mal messen, wie breit die Pfoten an der breitesten Stelle sind? Ich überlege dieses Modell umgebaut als Manticor für Warhammer einzusetzen. Dazu müsste es allerdings auf ein Streitwagen oder Höllenglockenbase passen. 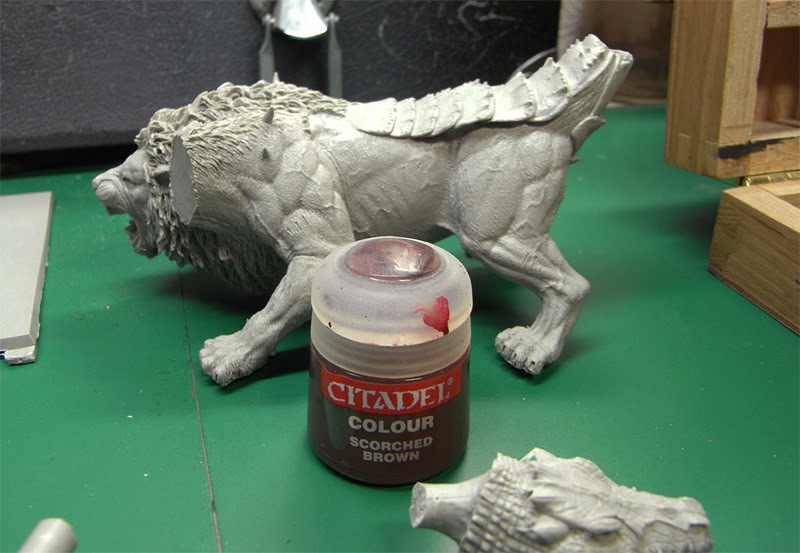 Although I never will paint that mini I always enjoy reading your reviews. 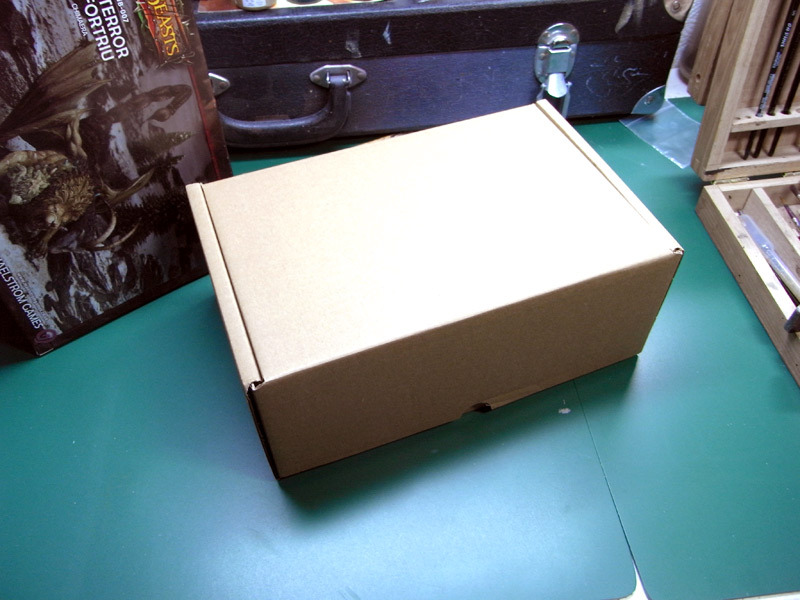 It is always nice to see your excitment, when you open the box and you already think about how to paint that part and can´t wait for your next big painting session. Hey thanks for all that feedback ... yeah it is a big massive brutal but damn great "Mini" - glad you enjoyed this review. Danke für dein Lob und deine netten Worte. "Ich habe mal noch ne kleine Frage bzw. Bitte. Könntest du mal messen, wie breit die Pfoten an der breitesten Stelle sind? Ich überlege dieses Modell umgebaut als Manticor für Warhammer einzusetzen. Dazu müsste es allerdings auf ein Streitwagen oder Höllenglockenbase passen." "I got a little question, kind of favour to ask you. Could you please mesure the distance between the feet as I am thinking about using the model as a Manticor for Warhammer Fantasy. 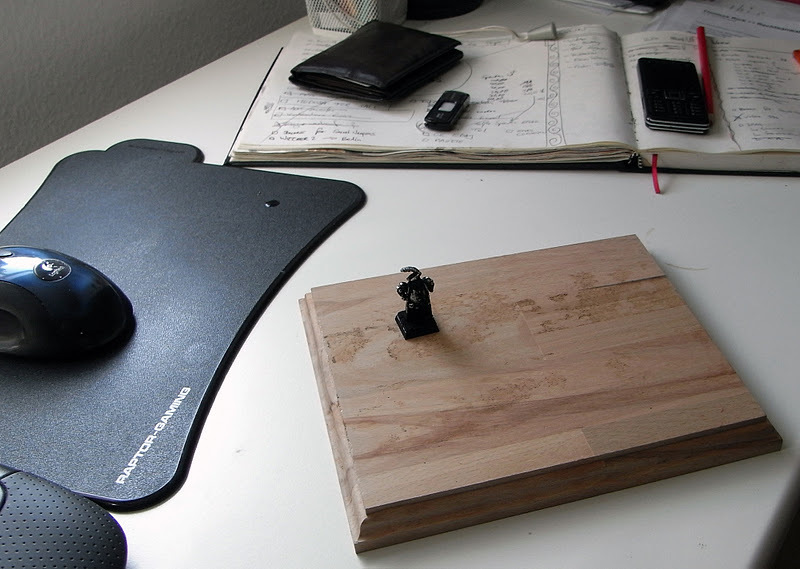 Therefore the model should fit on a regular gaming base"